Every once and a while I’ll go shopping. 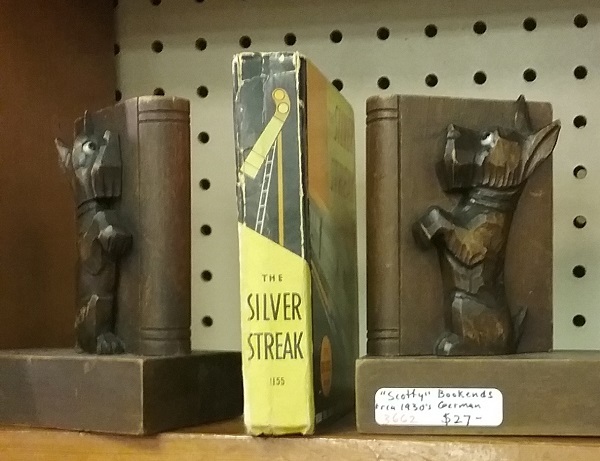 I try not to buy all the stuff, so here are the interesting bits that did not make it into my collection. 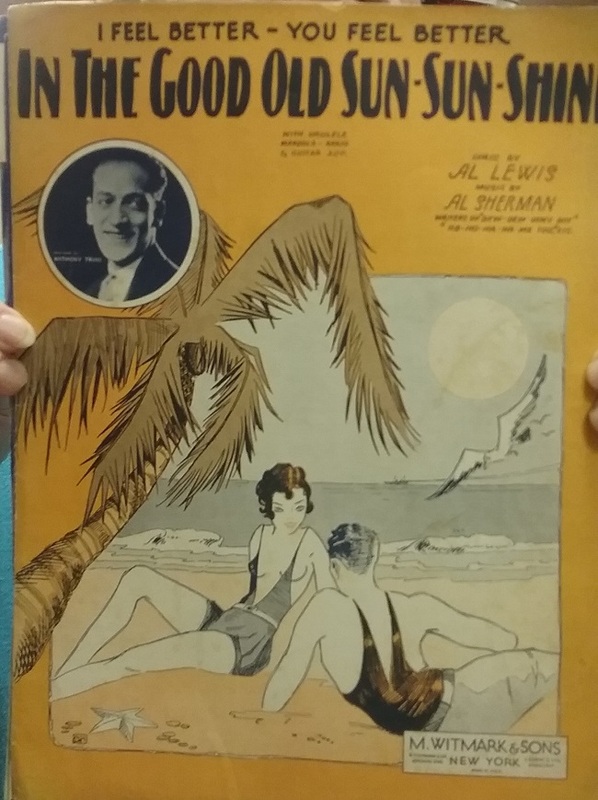 I usually won’t look through the never-ending stacks of sheet music that seem to inhabit every antique store in the land. But if there are just a few, I will take a peek because something you get interesting glimpses of period attitudes toward dress. I think I can safely say that this artist was a little too eager to portray the nakedness seen on beaches in the late 1920s. If only we could all blame weight gain on an over-eager Scottie! 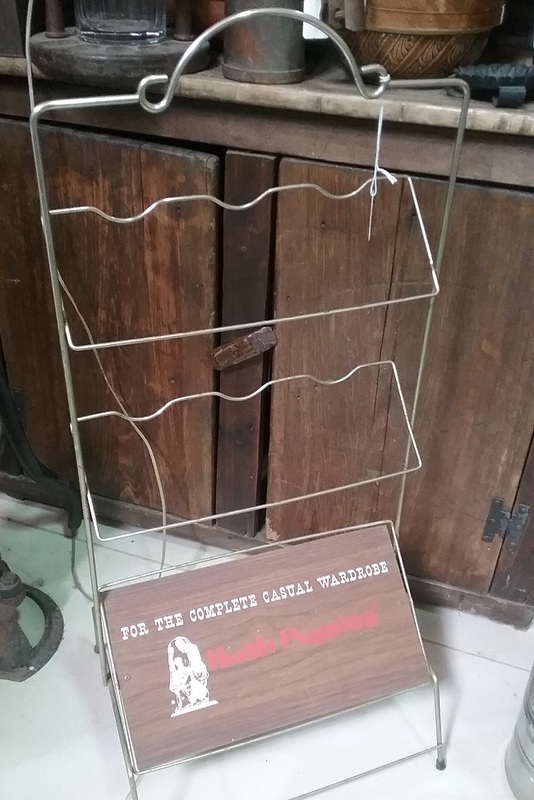 This Hush Puppies shoe rack was rather neat. If I were a collector of men’s shoes I’d have bought it. Is there no end to the designs that came out of the Enid Collins studio? Just when I think I have seen them all, another one pops up. 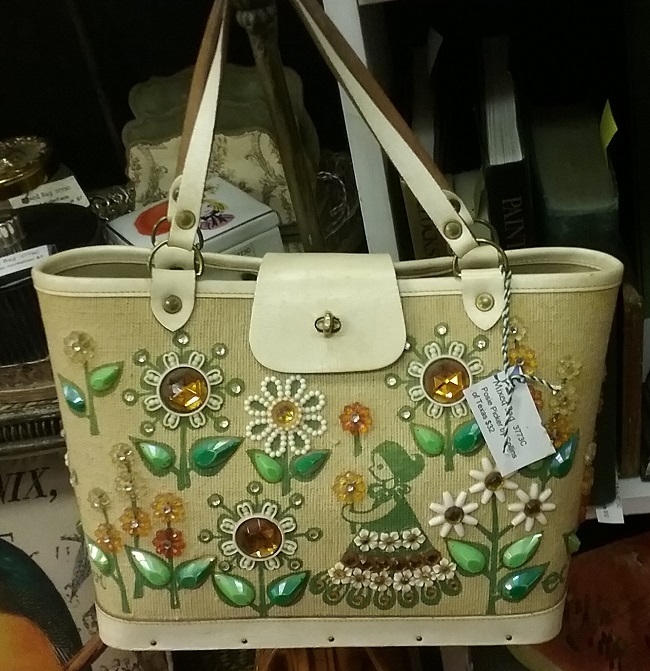 This one is called “Posy Picker”, and it had a bargain price tag. And here are even more Scotties, proof that I do not buy them all. I really couldn’t decide on whether or not this bag is actually older than a few years. 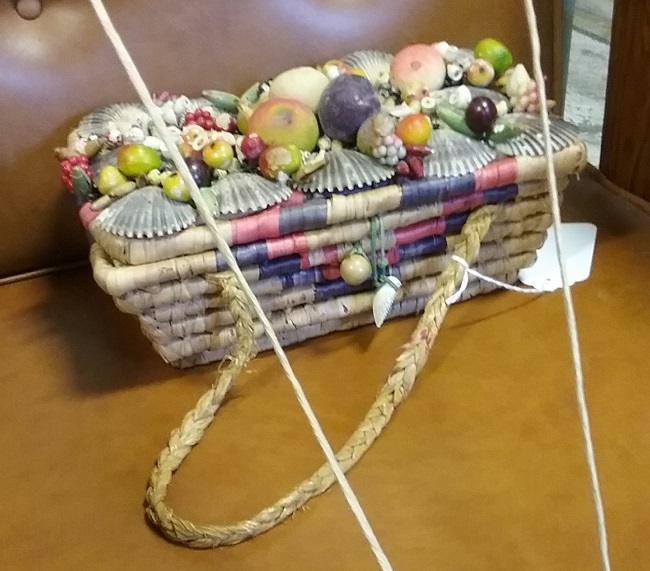 The basket itself looked to be newer, but the shell decorations looked older. The graphics of the late 1960s always make me smile. 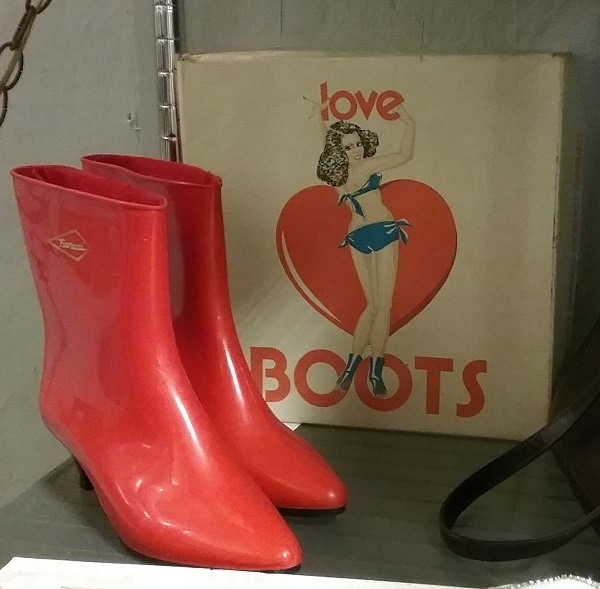 I posted this photo on Instagram and there we lots of people there feeling nostalgic about Fiorucci. There wasn’t a Fiorucci store in Western North Carolina so I missed that whole scene. 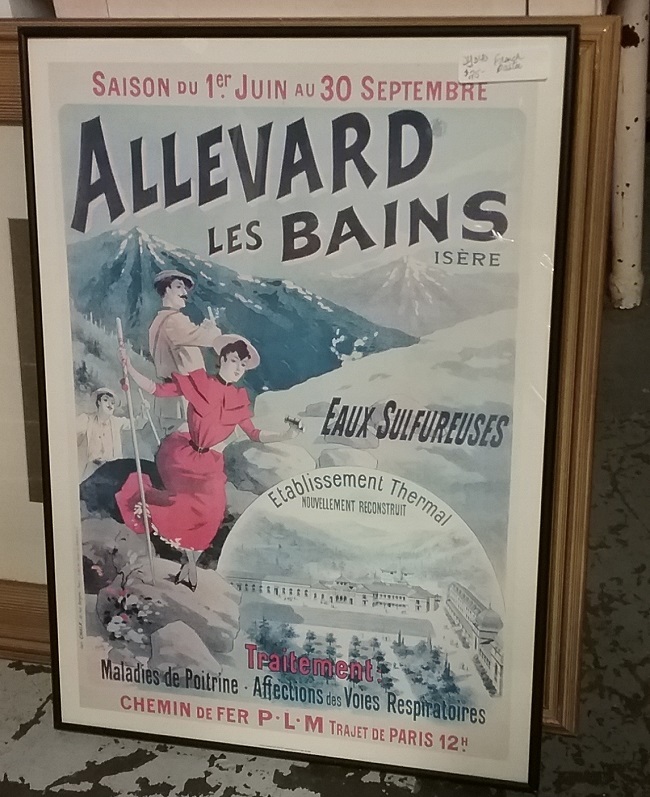 Yes, women did climb the Alps in skirts. Not every woman was Annie Peck. 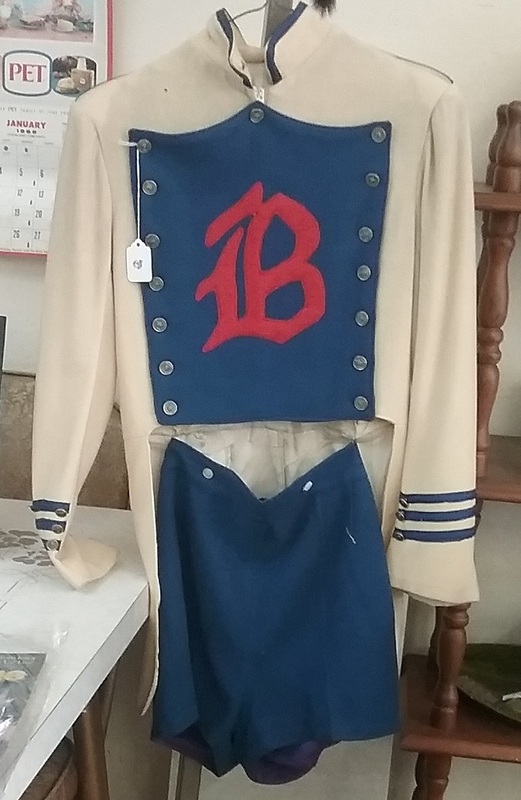 This nice old majorette uniform had some issues, and I was glad because that kept me from caving into an impulse majorette uniform buy. 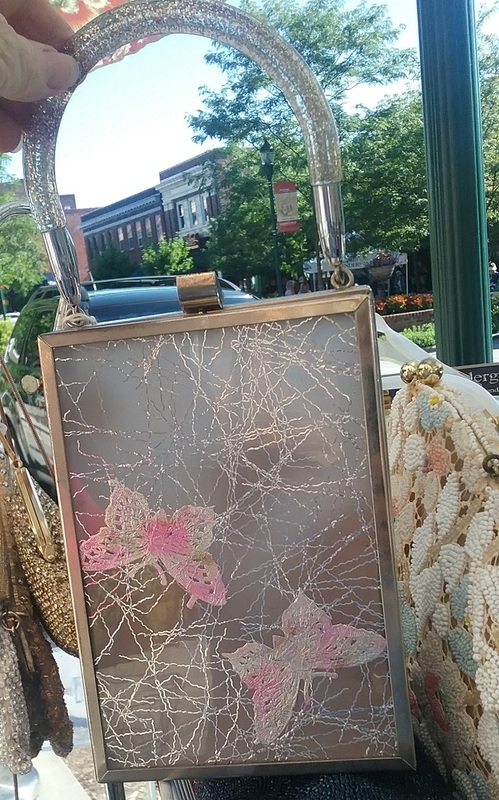 This lucite and metal bag with butterflies was really great, and it was, I thought, very under-priced. If you are a person in search of an affordable collecting hobby, I’d like to suggest evening bags. I’ve been noticing a drop in prices for some time, but at a show I went to last week the prices were insanely cheap. Supply exceeds demand. 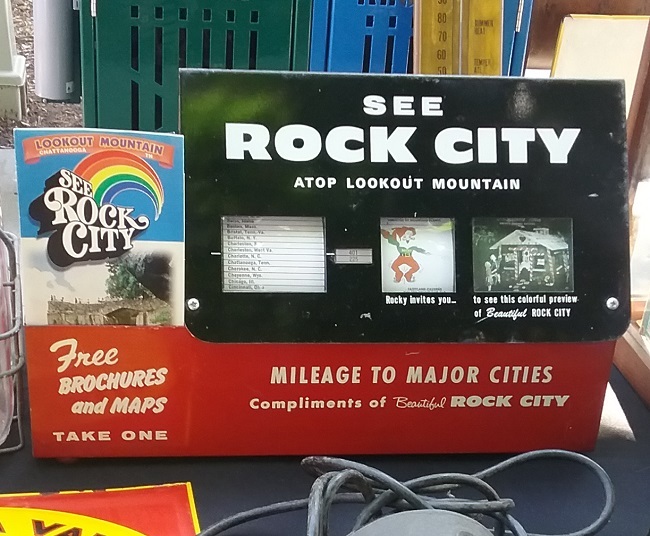 If you grew up in the South then you are probably aware of the unique advertising of Rock City. They would pay farmers to let them paint “See Rock City” on their barn roofs, and you can still buy the concept in the form of a birdhouse. My family went to see Rock City around 1966, and it was the biggest thrill. 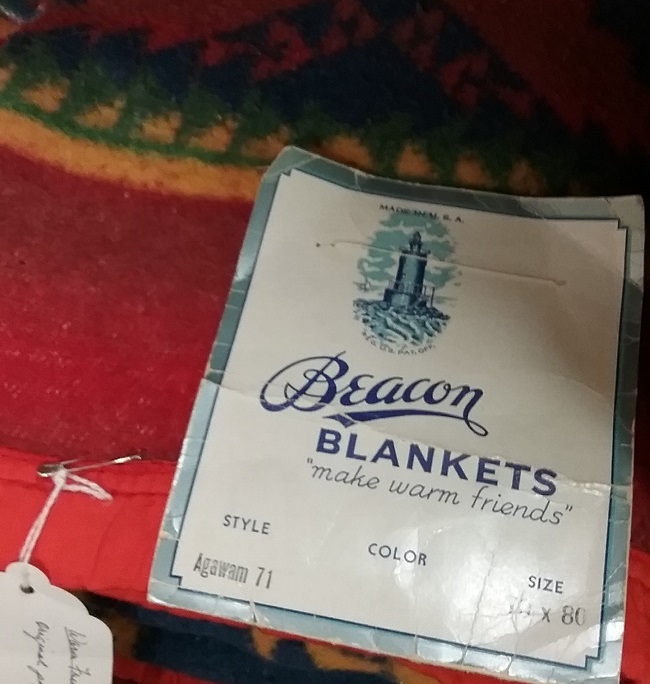 Beacon blankets were made in this area, so they are commonly seen. Still, it’s nice to see one that still has the original paper label. 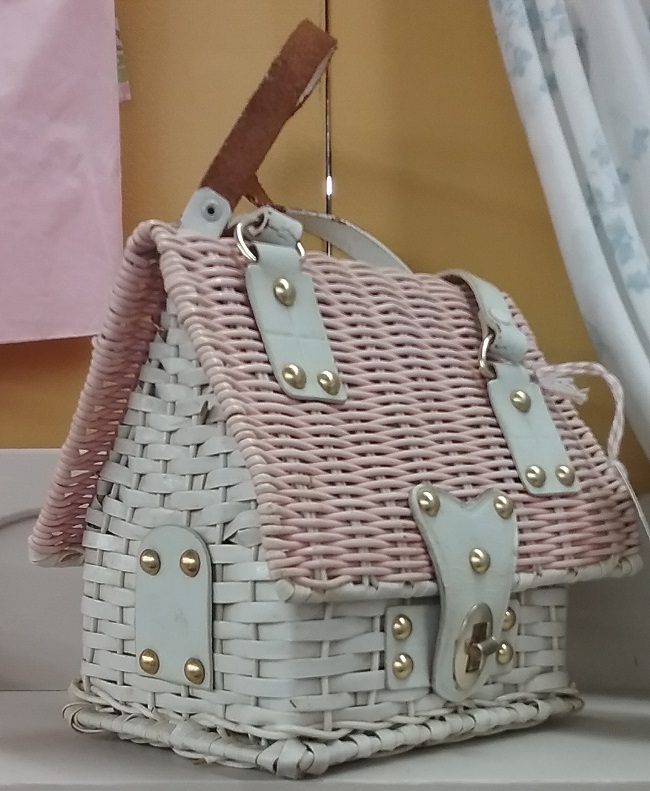 Wicker handbags were very popular in the mid to late 1960s, and this has to be the cutest one ever. Can’t say for sure, but perhaps it’s the tiny size of evening bags, and the growing size of cell phones, that has contributed (along with society’s irksome reluctance to dress up) to the lower price of evening bags? Several of my tiny ones have had to go. I’m hoping phones start growing smaller. You could be right about the size issue. I know I must have the smallest phone made, and it would not fit in many of the ones I commonly see. I just tried it in my favorite 1920s Whiting & Davis and I thought it was going to work, but then the clasp would not close. Love the Majorette uniform. 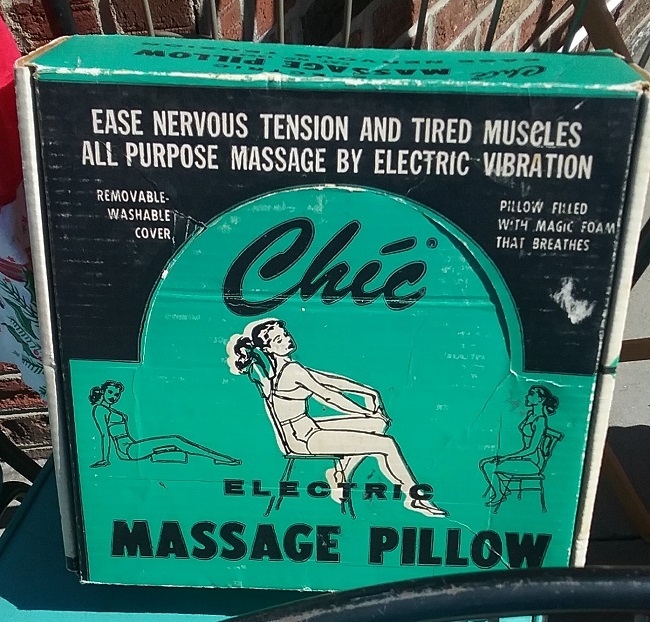 What an interesting category to vintage? I’m betting that someone, somewhere has hundreds of them! Don’t worry! 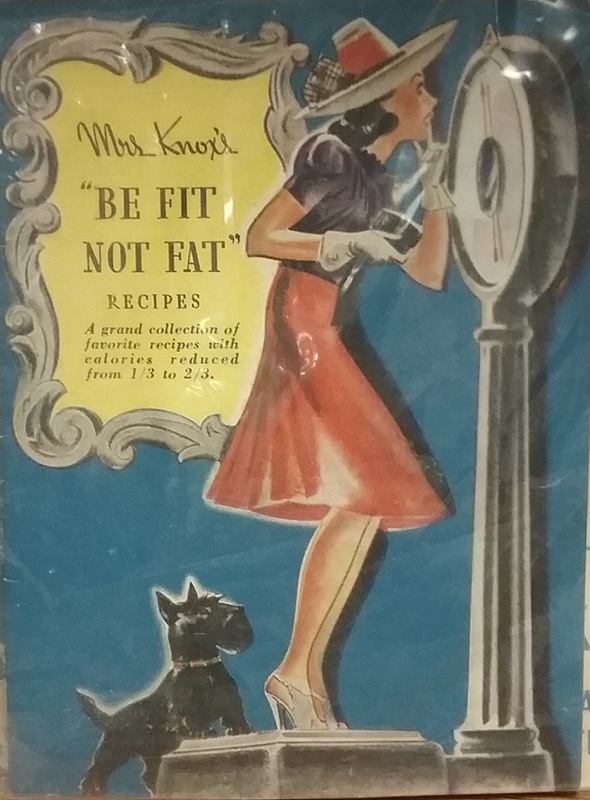 Mrs. Knoxx and her scottie are being preserved in our Museum collection! Really? That’s great. Is there a connection between Knox and Grand Rapids? Love when you do a shop-along. As far as evening bags. I am a collector of clutches and actually took a bunch of them along with me before I bought my last IPhone and didn’t get the largest one because it didn’t fit. I also retrofitted a Judith Leiber box clutch with a special back pocket for my phone when I do carry it. It’s untested at this point but eventually I will try it out. 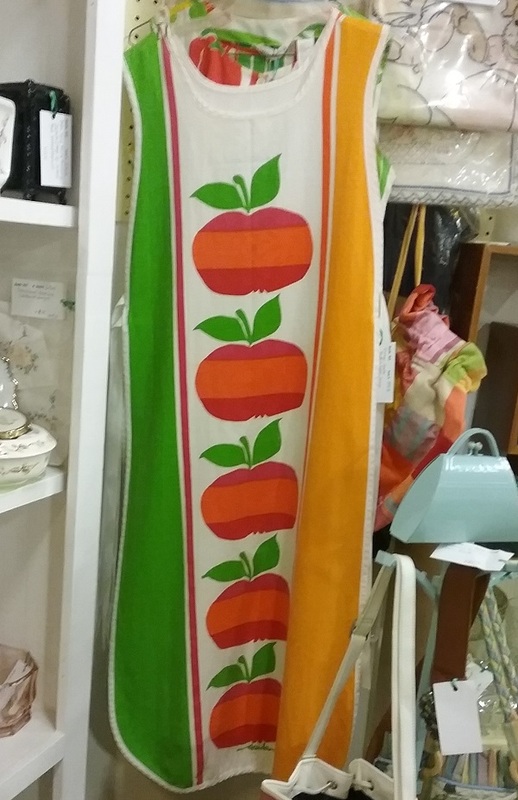 Again, what fun-I especially liked the 60’s apple graphics-was that an apron? It was an apron. Cute, no? I love small handbags, and one of the tests a new one must pass is the cellphone fit test. That last handbag appears to be in very good condition — probably because if you opened it while holding the handle, all the contents would spill out. Yes, it’s very cute, and very impractical! THAT PURSE!!! Oh my goodness! I’ve seen a lot of earlier ones that were dogs, monkeys, etc. but that is just a gem!